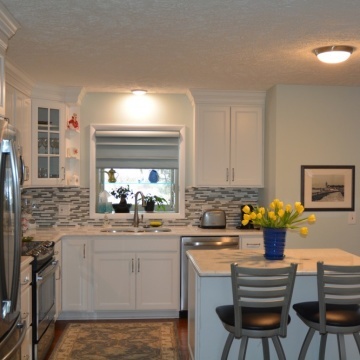 We were happy with the responsive approach to our kitchen remodel....from start to finish! Staff were wonderful listeners, expanding our design ideas with suggestions that were right on-target. We were so pleased with the friendly and hard-working crew....attention to detail from tidy workspaces to beautiful finished kitchen. Thanks to everyone! I was most satisfied with their professionalism, coordination right from the beginning, and quality of materials used. I heard about McDaniels Kitchen and Bath from an advertisement either in the newspaper or on TV. However, we've used this company before when we had our kitchen done 7-8 years ago. We knew that they could pull this together. The job is wonderful, Sue Davidson did a a wonderful job planing. I was most satisfied with the construction phase because of the professionalism of workers and their friendliness. Further they always kept me in the loop of what they were doing and when and were willing to answer all my questions. I couldn't have found a better team of people to work with for this project. Immediately impressed at the first meeting with the designer, Jenna Wey. A very professional and committed person. Very easy to work with and always available to answer any questions arising as project was ongoing. Joe Hunt and Dave Feldpausch were also very professional and knowledgable in all aspects of the project. Very comforting to know that when a question arises both of them could be contacted and I would receive a timely response. They were also very helpful in suggestions for the project. Cabinetry and finish work --- to me the most visible and therefore a very critical part of the project. The experience and patience to make that extra effort to do a great looking job. Working with McDaniels was nothing but a FABUOUS experience! The attention to detail, respect for our home, regular communication, high quality of workmanship and delightful people to have in our home. For a project that we dreaded to go through, this company made it a painless breeze. We can't say enough good things about the job that the did. We asked for and were given a timeline of when each step would be started and completed, and this was accurate within three days. The project was started when it was extremely cold, and we were having a gas line put in. We were asked if it would be okay if the guys could install the gas line when it was warmer. It never did warm up, so they completed the task on the third day. The only other snafu was the microwave. The screws from the manufacturer for installation were too long and penetrated the interior of the oven, destroying the oven. On the third installation, the guys knew what was wrong and bought screws that were the right size. We also had a problem with a few cabinet doors and drawer fronts. The first time they came a few were measured incorrectly. The manufacturer then sent replacements that were incorrect. Third time was a charm! They arrived on the last day and were installed, thus completing the project on time! All of the providers were so professional and respectful and courteous! We were very favorably impressed! The job was completed on time, and the end result is outstanding. I have heard horror stories from others who used different companies. I have only heard good things about McDaniel's. When spending this much money and time, it's better to have it done right. I highly recommend McDaniel's for your project and will be contacting them again when I'm ready to re-do the bathrooms! The end product is outstanding. 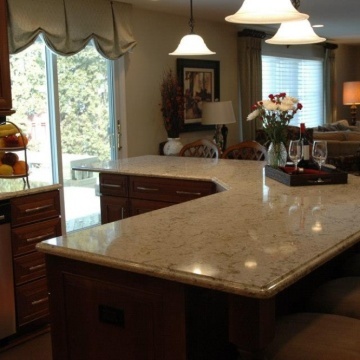 McDaniels Kitchen and Bath's communication was very good and their quality of workmanship was excellent. Julie, the designer on my bathroom remodel plus foyer/trim work, gave me exactly what I was looking for but better, while still keeping the architectural integrity of my 1920s home. Staff of McDaniel's, Granite Construction, and subs handled the old plumbing, electrical, subfloor and other surprise problems easily. They were professional, trustworthy, courteous, and knowledgeable. Very satisfied with all aspects of the project. A slight miscommunication with the completion of our project. But once notified, McDaniels completed all items very quickly. I love the completed design. Our designer worked very hard to make sure we were satisfied. WE LOVE MCDANIELS AND SUE!! I recommend McDaniels Kitchen and Bath very highly. They were great. Every day my husband says, "I love this bathroom." All their people are so professional and courteous and they worked within the time frame. 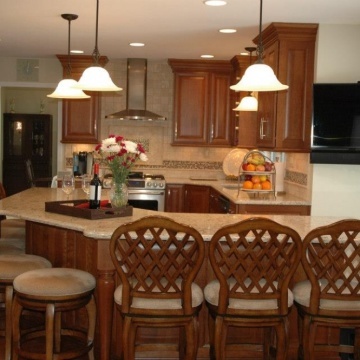 We have used them before and we trust them with the plan, workmanship, and their professionalism. They have always worked in a timely manner and I really appreciate their quality service. The design was perfect for who I am and the blending from room to room was wonderful, the choice of materials perfect. for my lifestyle. WORKING WITH OUR DESIGNER WAS GREAT. 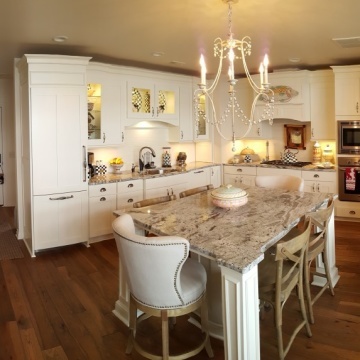 SHE TOOK THE TIME TO LOOK FOR CABINETRY THAT WOULOD COME CLOSEST TO MATCHING OUR EXISTING CABINETS AS WELL AS BEING VERY HELPFUL IN MAKE MATERIAL CHOICE WHILE STILL LISTEN TO WHAT WE WANTED. McDaniels remodeled our kitchen five years ago. It was a much smoother experience. That is why we chose McDaniels for our bathroom remodel. I was most satisfied with the designer. He was reasonable and easy to work with. He had good ideas for difficult situations. We thought the workmanship and the quality of the materials was excellent. 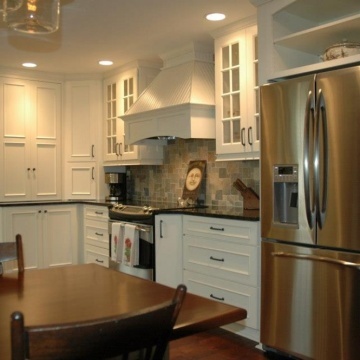 I heard about McDaniels Kitchen and Bath from a friend who had their kitchen redone. Quality of materials and workmanship was excellent. Professionalism and level of expertise of all involved in our project, starting with Dave Kirkey, Steve Driggs and crew, to subcontractors. Also very happy with the scheduling and coordination of work done by various trades. Had worked with them on our master bath remodel 5 years ago. Great people to work with. McDaniel's staff helped guide us through this big project with few glitches. We can't be happier with the great result. A neighbor used them and we liked the work they had done. 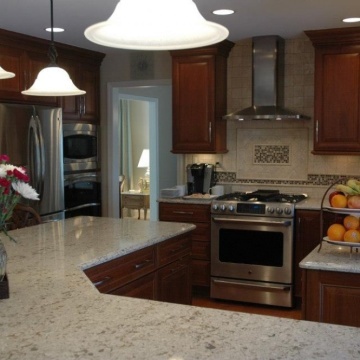 I was satisfied with the overall process of working with McDaniels Kitchen and Bath. I worked with them in the past so I knew to expect dependable and quality service. 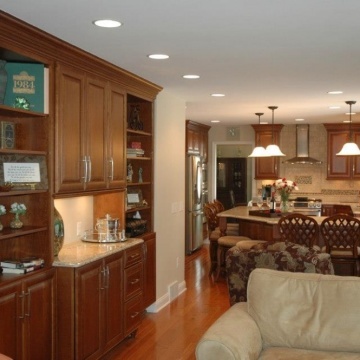 I first heard about McDaniels Kitchen and Bath years ago through a friend who referred me to them. They remodeled our kitchen and did a great job so we hired them again when we decided to start another project. McDaniels Kitchen and Bath did a great job on my project! Sales experience in store was exception both with the sales and the construction company. Very professional! Attend church with one of the sales people. We are very satisfied with the completed job. We are glad we had professional help with both the sales portion of the project and the construction of the project. We used McDaniels them years ago. I was most satisfied with the subcontractors and the people who were on the job. They were all very professional and outstanding. Great quality. This was our 4th project working with McDaniels. The first one was 15-16 years ago and I was so impressed with them that I decided to continue using them.